Kollywood's rising star Siva Karthikeyan is celebrating his 30th Birthday today, on 17th February. The anchor turned comedian and hero has apparently busy with his upcoming Tamil movie Rajini Murugan and hasn't taken any break. 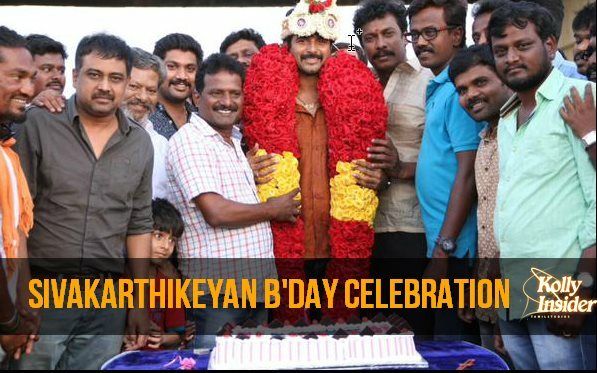 Apparently, Siva Karthikeyan's friends including producer N Lingusamy, Sathish, Pandiraj, KE Gnanavelraja and others have planned for a party and paid a surprise visit to the sets of Rajini Murugan. Siva Karthikeyan, Keerthi Suresh and others are currently shooting for this Ponram directing Rajini Murugan in a small village near Madurai. Meanwhile, Siva Karthikeyan's Kakki Sattai is all set for February 27th release.